Who does Elite test for Radon? Radon gas occurs naturally in the soil, and is produced by the radioactive breakdown or decay of uranium and radium. Long ago, glacial activity left behind ground-up deposits of many minerals such as uranium in the soil or upper crust in Iowa. Because radon is a gas it can seep into buildings, including homes. It is an odorless and invisible gas that is also radioactive and harmful to humans when inhaled. Where is Radon found in Iowa? EPA has identified all counties in Iowa as Zone 1. 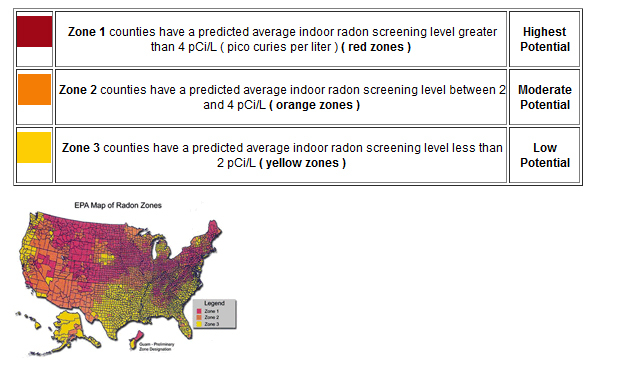 Zone 1 counties have a predicted average indoor radon screening level of more than 4 pCi/L ( picocuries per liter ). The total average indoor radon level in Iowa is 8.5 picocuries per liter ( pCi/L ) of air, and in the United States it is 1.3 pCi/L of air. Average radon levels of 4 pCi/L are considered elevated, and remediation is recommended. The primary source of high levels of radon in homes is in the soil below and soil surrounding the home. It is found in new and old homes, and in homes with and without basements. Based on data collected from radon home tests, the Iowa Department of Public Health ( IDPH ) estimates that as many as 5 in 7 homes ( or greater than 50-70% ) across Iowa have elevated radon levels. Radon levels can vary from area to area and can vary considerably from house to house, even on the same street and neighborhood. A high and low level of radon can be found in homes directly next to each other.